The Cuba Five. Kingsmill Massacre. Death of Tip O’Neill. 1871: British authorities release over thirty Fenian prisoners including John Devoy and Jeremiah O’Donovan Rossa. The conditional amnesty of 1871 required those released not to return to Ireland for the term of their respective sentences for treason. 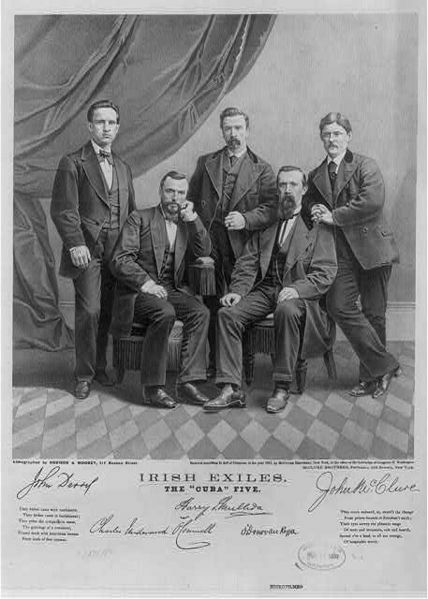 Devoy, O’Donovan Rossa and three others: Charles Underwood O’Connell, Henry Mulleda, and John McClure boarded the S.S. Cuba bound for New York where the “Cuba Five” were greeted as heroes by their Irish brethern. 1976: The Kingsmill Massacre. 10 Protestent men are shot dead returning home in a mini-bus from a textile factory in Bessbrook. The attack took place near the village of Kingsmill, carried out by a group calling itself the South Armagh Republican Action Force, almost certainly consisting of Provisional IRA members. The men were targeted purely because of their religion and in retaliation for the murders of six Catholics by the UVF the previous day. Born to Catholic parents of Irish descent (Mallow, Co. Cork) in a working class area of Cambridge, he first became active in politics when working for the failed presidential election campaign of Al Smith, (the first Catholic to seek that office) in 1928. “All I knew was that Al Smith was an Irish Catholic and we had been suppressed all our lives,” he said. O’Neill succeeded John Fitzgerald Kennedy to what was then the 11th Congressional District, when Kennedy became Senator in 1953. 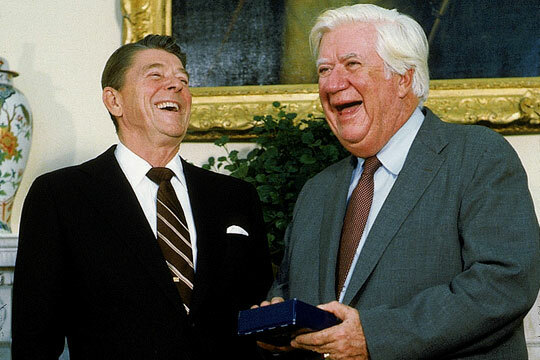 O’Neill regularly butted heads with fellow Irish-American pol Ronald Reagan. “I never forgot from where I came. He kind of forgot,” O’Neill wrote, but they were also amiable acquaintances. “Until six o’clock, I was the enemy and he never let me forget it,” wrote Reagan in An American Life. A strong supporter of John Hume he worked with Daniel Patrick Moynihan, Ted Kennedy and Governor Hugh Carey to reduce US funding for IRA activities in Northern Ireland and helped build a bipartisan peace process. O’Neill’s autobiography written with William Novak Man of the House is a fine read on American politics and its characters. Editor of Today in Irish History, Conor Cunneen is just the 63rd person in the history of Toastmasters International to be awarded Accredited Speaker designation. As a Chicago based professional speaker, this Irishman’s client base ranges from Harley-Davidson to Helsinki, from Memphis to Madrid as he Energizes, Educates and Entertains his audience to grow their business, people, teamwork and productivity. Here is a clip of Conor speaking about the importance of vision that might just get you thinking (and laughing) as we move into the New Year.